A young girl named Meela a lupian (a race of people with wolf-like features) trying to survive on her own. Meets a mute mercenary named Feral that is also a lupian and decides to tag along. Excitement, danger and humor follows them along their journey across their world. When dark secrets are revealed they must face the truth about their past and fight to stay alive. This is my first post and I wanted to started off with a webcomic that grabbed my attention the first time I started it. Strays is fantasy, action/adventure webcomic written and drawn by Samantha Whitten A.K.A Celesse and Stacey Pefferkorn A.K.A Algy. the story is centered around Meela and Feral relationship and showing how a mute mercenary is reluctantly taking care of a young energetic girl while still going on his missions. Other characters come in and add more variety to the cast of characters and makes it enjoyable to see the characters interacted with one another. The story has some good comedy between the characters that really did make me smile. The comic has fights that are enhanced with magic and quite character building moments. It feels good to have those elements mixed in together to give a lively story. The darker story points that are in this comic is handled well without having the story become straight up sad and no fun. Feral begging a mute fascinated me the first time I saw these because I never have read a comic with a mute character in it and made me wonder how the both artist was going to express all his range of emotion and express himself to the other characters without a word. They did a great job showing how he feels dealing with different situations. This plays great with the talkative young girl Meela that bring so much fun to the story as she is still young and doesn’t know much about the world. Learning things about this world along with her is great and you she her grow and understand things more on this journey. This is all made possible by the great art work that goes into the comic. It is all done with color that further puts you into the world with the characters. The character designs are practical and not overelaborate and it works with the feel of the story. You can feel the love and effort that the two artists have put into the art work. The different facial expressions for all the characters seems to be slightly anime inspired in how the characters emote. This just helps gives more personality to the characters. The stories of Strays have been conclude with three volumes and a epilogue. The paper copy of the Strays is available to purchase and other merchandise. However, it does have the potential to come back per creator Celesse and hope it does. 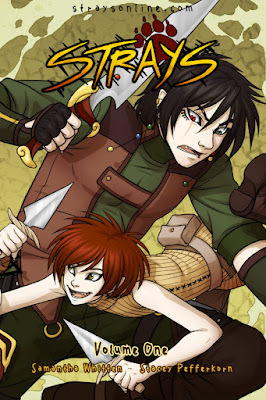 Celesse does have another webcomic GamerCat that I will be checking out.